since we’re taking a little longer to gather our pictures from C2E2 last weekend, i’ll take this opportunity to let you know that we will be at Third Eye Comics in Annapolis, MD for their Free Comic Book Day / 5-year Anniversary par-tay! they have some amazing guests including Gail Simone and Cullen Bunn and ID COMICS STUDIOS (of course). theFranchize, Peng-Peng, and Flash will be there representin the studio. we hear there’s gonna be a Doctor Who photo booth and TARDIS as well as free food from Applebees! 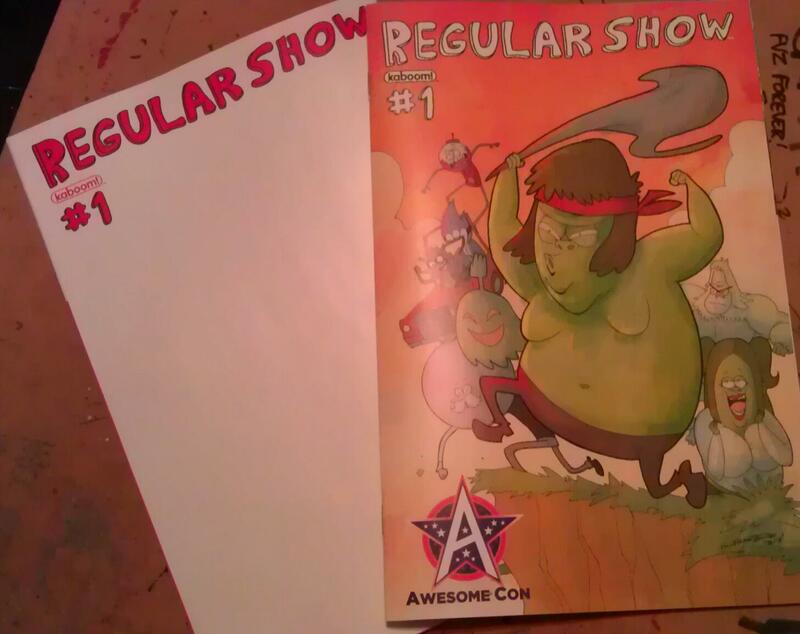 as if that weren’t enough reasons to spend ur FCBD with us, theFranchize’s Awesome Con exclusive cover for Regular Show #1 has arrived just in time! (drawn by Jerry Gaylord | colored by Lauren Affe) this cover is particularly awesome because on the back is a space for you to get a sketch from him! now if that isn’t collectible, i don’t know what is.